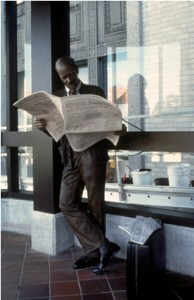 Passengers often pause for a moment and recognize reflections of themselves in this life-size bronze sculpture of a commuter reading a newspaper. Perfectly integrated into his environment, the figure represents Mr. Johnson’s concern with the relationship of his sculpture to its surroundings and audience. Both the Detroit Free Press and the Detroit News are featured in this personalized work. Funded By: City of Detroit, Detroit People Mover Art Commission.